You can help to decide whether there should be an elected assembly in the North East region. local government would be reorganised into a single-tier in those parts of the region that currently have both county and district councils. Should there be an elected assembly for the North East region? The Labour government attempted to introduce directly-elected English regional assemblies. The London Assembly was the first of these, established following a referendum in 1998, in which public and media attention was focused principally on the post of Mayor of London. Ken Livingstone, the first directly elected Mayor of London, saw the London Assembly as a recreation of the Greater London Council, which he had led before it was abolished in the 1980s. Voters were asked whether they wanted an elected regional assembly to be created for their region. The structure and powers of elected regional assemblies was outlined in a Draft Regional Assemblies Bill presented to Parliament by Deputy Prime Minister John Prescott in July 2004. The creation of regional assemblies was to be tied to abolition of the existing two-tier structure for local government in these regions; and its replacement with a uniform system of unitary authorities. In areas that had two-tier government (Cheshire, County Durham, Cumbria, Lancashire, North Yorkshire, Northumberland), voters were to be asked which pattern of unitary government they would like to see. Two options were proposed by the Boundary Committee for each county in the review area – generally consisting of a single unitary authority for the entire county, or a break-up into smaller authorities which are larger than the existing districts. It was recommended that ceremonial counties be left untouched in most cases. This recommendation was broadly (with one minor alteration in West Lancashire) accepted by the Office of the Deputy Prime Minister. Voting was to take place on a per-county council-area basis, except that the Cumbria and Lancashire votes would have been run as one – since it would be impossible to have option 1 in one and option 2 in another. Any changes as a result of the North East referendum would probably have come into effect on 1 April 2006 – to give time for preparation, and taking into account 1 April as the traditional day of local government reform in the UK. In Lancashire and Cumbria the proposals for multiple unitary authorities were very similar to those proposed by the Redcliffe-Maud Report in 1969. This proposed authorities for North Cumbria based in Carlisle, and one for Morecambe Bay covering Barrow-in-Furness and Lancaster for the north of the region. In central Lancashire there were to be divided into four authorities based on Blackpool, Preston, Blackburn and Burnley. The area of West Lancashire was to be given to Merseyside and included with Southport in a district. All voters in the North East England region were asked to vote on the question of whether or not there should be an elected Assembly. Voters in County Durham and Northumberland were asked to vote on an additional second question on proposals for local government reorganisation in the event of a "yes" vote. If an assembly is established in the North East region, it is intended that local government will be reorganised into a single tier in those parts that currently have both county councils and district councils. Your part of the region has currently both county councils and district councils. You can help to decide how local authorities in your part of the region will be reorganised into a single tier. There will be no such reorganisation if an elected Assembly is not established. On 4 November 2004, in a turnout of almost 48% in an all postal ballot, voters in the North East decisively rejected the proposed regional assembly. The reasons for this result are varied; however, it is felt[by whom?] that the regional power would have been concentrated in an Assembly situated in Newcastle upon Tyne, which given the strong historic rivalries between urban centres in the North-East may have caused resentment from the people of Sunderland and Middlesbrough. Notwithstanding this, in the Newcastle upon Tyne local council area itself the majority of votes cast were against the proposal. It was also felt that not enough of a case had been put forward for the necessity of the Assembly, and it was feared that it would add another layer of politicians and public servants, thereby increasing taxes for the citizens of the areas affected. The referendum result was declared at 00:52 GMT on Friday 5 November 2004 at Crowtree Leisure Centre in Sunderland by the Chief Counting Officer for the North East region Ged Fitzgerald, who was also then Chief Executive of Sunderland City Council. * Valid and rejected votes divided by electorate. The counties and unitary authorities of England, if "yes" and option 2 is chosen in all referendums. Similar referendums had been planned in North West England and Yorkshire and the Humber. These were postponed on 22 July due to issues with all-postal ballots – there were many allegations of fraud and procedural irregularities. 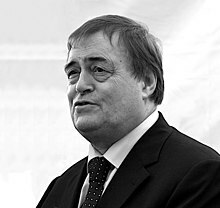 Following the rejection of the proposal in the north east of England the Deputy Prime Minister John Prescott at the time, ruled out holding further referendums in other regions for the foreseeable future. These were the proposals for local government reorganisation in Northwest England. After the result in North East England the planned referendum for the region was postponed indefinitely and was never put before the electorate. These were the proposals for local government reorganisation in the Yorkshire and the Humber region. After the result in North East England the planned referendum was postponed indefinitely and was also never put before the electorate. This page was last edited on 11 February 2019, at 19:34 (UTC).